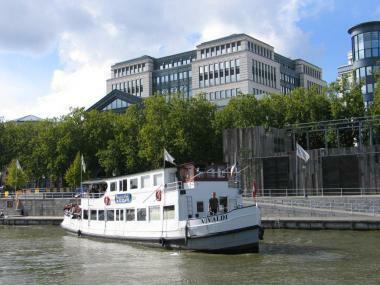 2012-12-21 – The Regional Government of Brussels gave the go-ahead on Thursday 20 December for plans to create a regional park on the left bank of the Béco dock, the port of Brussels dock which is closest to the city centre, on Avenue du Port, between Place Sainctelette and Place des Armateurs. Thanks to this approval, the Port of Brussels and the Region will continue the urban integration work begun several years ago, and most notably involving the regeneration of the first section of embankments of this former industrial dock. This renovation has enabled numerous events to be organised there, the best known of which is probably Bruxelles-les-Bains, the Brussels’ summer beach. Specifically, the land in question will be transferred to the Region by means of a long-term lease. The income generated by the lease will be used by the Port to acquire land in the approach to the Port in order to develop port-related and logistical activity there that is directly related to the waterway. The future park, whose theme will be linked to the adjoining waterway, will be created by the Region and financed by the Beliris funds(*). This plan more broadly forms part of the development of green space in the district, through the creation in particular of a large park on the Tour & Taxis site. (*) Cooperation agreement between the Federal State and the Brussels-Capital Region providing for initiatives to promote Brussels’ international role and its function as a capital. Description (alt): The future park will represent an extension of the plantations to the right of K-nal, in the Tour & Taxis direction.